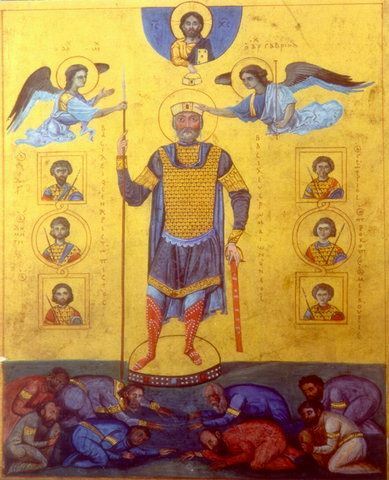 Basil II was Byzantine Emperor from 10 January 976 to 15 December 1025. He was the second longest reigning emperor after his brother Constantine VIII whom he named co-emperor in 962, but outlived him by 3 years. The early years of his long reign were dominated by civil war against powerful generals from the Anatolian aristocracy. Following their submission, Basil oversaw the stabilization and expansion of the eastern frontier of the Byzantine Empire, and above all, the final and complete subjugation of Bulgaria, the Empire's foremost European foe, after a prolonged struggle. For this he was nicknamed the Bulgar Slayer, by which he is popularly known. At his death, the Empire stretched from southern Italy to the Caucasus and from the Danube to the borders of Palestine, its greatest territorial extent since the Muslim conquests four centuries earlier. His reign is therefore often seen as the medieval apogee of the Empire.